The hyaluronic acid (sodium hyaluronate, active ingredient) of DeneB is a glucosamine consisting of disaccharide units of D-glucuronic acid and N-acetyl-D-glucosamine. Treatment with DENEB® Classic-H / S is a non-surgical procedure. It is performed as an external patient and under local anesthesia. The result is visible immediately. After treatment, the patient can start working normally, or engage in their leisure activities. 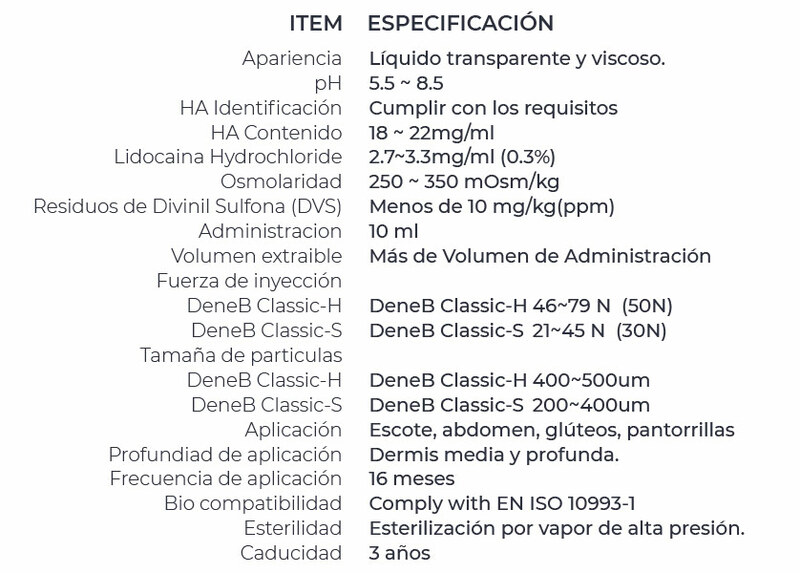 DENEB® Classic-H / S is implanted by means of an easy procedure and causes little or no bruising. The effect achieved with DENEB® Classic-H / S lasts several months but depends on the type of skin and external factors performed. In many cases, an annual follow-up after the first treatment is sufficient. Market researches and surveys have shown that a large number of people would like to make small changes to their body and would like to adjust the shape of their body, in a natural and non-permanent way that does not require the use of implants, body fat or stem cells in a major surgery. Many of them also refuse to undergo general anesthesia or to be left with a scar afterwards. DENEB® Classic-H/S shows a natural opportunity without the use of implants, autologous fat injections, or surgical procedures. Hyaluronic acid is a natural component of human skin that plays an important role in health. It is not derived from animals, so there is no risk of usual allergic reactions or disease transfer. With DENEB® Classic-H/S, the procedure is short and only requires local anesthesia which avoids the risks of a full anesthesia. The treatment is not permanent and, unlike permanent (non-reversible) procedures, these procedures offer the possibility to adapt the natural shape of the skin and body. It binds the moisturizing perfectly and at the same time stimulates the regeneration of collagen. This gives the skin a new elasticity and creates a fresher appearance. That’s why hyaluronic acid fillers like DENEB® Classic-H / S provide a great opportunity to restore tissue volume. To minimize adverse events and side effects, the product should only be used within its indications, for example: body contour fillings should not be used in facial regions. Our intradermal fillers should only be applied if the area to be treated does not show inflammation. An extended anamnesis is as solid as the basis of a successful treatment, as the application by an experienced professional. The treated area should not be exposed to intense heat or extreme cold, or constant pressure, for a few weeks, until the initial swelling has faded. The injection should be done by doctors with knowledge and experience in fat transplants and similar treatments. Only correct 100% of the desired volume effect.